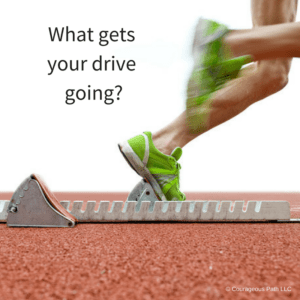 Are You on Track to Hit Your 2018 Goals? July is fast approaching. Did you execute everything you wanted for the first half of 2018? Are you on track to hit those New Year’s Resolutions out of the park? Most people set goals that have no meaning. Therefore, it’s easy to push them aside or get distracted. After all, we live in a time with an abundance of opportunity. Yet, we rarely learn how to distinguish what to say Yes to and what to say No to. (1) Set goals that excite you. Can you wake up every morning and be excited about what you’re working on? Imagine what it will feel like to have accomplished that goal. Embody the energy of a completed goal every morning. There’s a difference between, I want to lose 10 pounds versus I want to have more energy to play with my kids. This is what also helps when obstacles, barriers, and problems are in the way. (2) Schedule time in your day to work on your goals. Do you have dedicated, uninterrupted time block (2 hours a day) to reach your goals? Two hours a day times 365 days a years is 730 hours. How much progress can you make in your career, life, or relationships when you dedicate 730 hours a year to it? When your goals hit an obstacle or life throws you a curveball, what strategies do you employ to get back on track? What resources do you need? Did you know that Olympic runners create a strategy for what they will do if they fall during a race? They even practice how they will get up. Bring meaningful, impactful goals into your career, life, and relationships. If you truly want to make an impact on those around you and society at large, it’s up to you to show up every day dedicated to make this happen. P.S. I’m offering a special opportunity to bring this together for you in real-time this August. I want you to reach the next level in your career, life, and relationships. Come spend 4 days and 3 nights with me in beautiful Estes Park, CO where we will create your living legacy, release what’s holding you back, and step into a bigger, bolder, braver you – ready to live out your life-sized ideas and dreams. Email me and let’s see if you’re a good fit. Let’s not wait another 6 months to turn your dreams into reality. Have you ever started a Google search only to end up watching 3 YouTube videos, having 10 different websites open, and losing 3 hours of your day? It’s okay to admit it. Most of us have been there at some point. With more technology, you are bombarded by information 24/7. Or maybe, you’ve read leadership books or taken an online course, but then what? You likely didn’t implement anything. You’re not the first and you’re not alone. The problem is knowledge doesn’t get us anywhere. True growth only happens when we implement new knowledge. I’m here to tell you that something has to change. I know you’re a strong-willed, motivated person. I know you want to impact the world with big ideas. I know you want to be a positive person and lead those around you, whether it’s at work, at home, or in your community. It’s time for you to make a positive difference in the world. It’s your time to stop thinking about it and start doing it. I believe you can do it. Because of this, I’ve created the inaugural Courageous Path Outdoor Retreat to get you going. Together, we will identify the impact you truly want to make. We will identify and conquer the obstacles you face. And, ultimately, build the courage to step into the career, life, and relationships you truly want. It’s time to let go of what’s holding you back and step into the future you’ve been dreaming of. Together we will use nature as our guide to implement the changes you want. This small group atmosphere away from technology will get you still, move you in purposeful directions, and build your courage muscles to implement your dream and make a huge impact. Ready to implement your dream instead of talking about it? This retreat will take place August 11th-14th. Want to know more? Email me or PM me on social media to get the details. Do you want to be in the same place three months from now that you are in today? What choice will you make? I’m here to guide you to your full potential and live life to the max. There are only 3 spots left. Contact me today. Who Cheers You on When You’re Down? In our life, career, and relationships, we all go through turbulent times at some point. Life is not always a pretty picture of an ocean wave or scenic mountains. Losing a job, losing a loved one, or even a bad fight can strike at your heart or deep into your soul. Most have love to give. Yet, in difficult times, its learning how to receive, ask for help or give yourself grace that is key. We love to put on a façade. All day we wear a colorful mask that looks beautiful on the outside yet covers the pain inside. When someone asks “How are you?”, you immediately say “Fine” like a blink of an eye. When life isn’t so grand, it is important to have cheerleaders in your life. People who support you, listen, and raise you up. 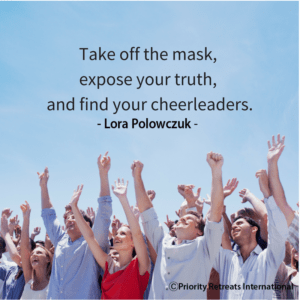 It’s time to take off the mask, expose your truth, and find your cheerleaders. I recently published an article, How Hockey Healed Me, in The Good Men Project. The article describes how I overcame severe depression and suicidal tendencies as a young teenager. A band of strangers unknowingly supported my journey. These strangers turned into friends who became my cheerleaders. This is the first time, I have publicly conveyed this story in writing. Your cheerleaders are your community – the people who surround you. This is why Community Engagement is a prime pillar of the Courageous Path framework. It specifically guides you back to deep, rich, soulful connection with others and yourself. I’m creating a community for you! Yes, you! Today, I’m officially announcing the inaugural Rise Above: Experience More outdoor retreat scheduled for August 11-14 in Estes Park, Colorado. I’m only accepting 5 folks who want to reach the next level of their life, career, and relationships. At this retreat, you will identify your dreams, bust through your obstacles, and develop courage muscles to go bigger, farther, and do more of what’s fulfilling to you. Are you ready to live your life to the fullest? To your highest potential? And really make it happen? It’s your time. This is your year. I’m creating this community to support you to reach and attain your highest endeavors. Do you want in? Email me and we will schedule a short chat and see if you’re a good fit. It’s your time to have a community of supporters that raise you up, not tear you down. Dreams are not as far fetched as you may think. Gillian laid in bed one night. For twenty years she dreamed about playing in an orchestra again. When Gillian was in high school, she loved how playing the violin made her feel inside. Gillian’s soul vibrated as the melody’s tone went up and down in pitch. Then, all came together in harmony with the other instruments. She dreamed one day of being a conductor, leading an orchestra with the state symphony. As she got older, she dropped playing the violin. Her job was demanding as was her new family. Yet, every time she listened to classical music, her heart vibrated with joy. She got present in the moment, and her body was electrified inside and out. Out of the blue, Gillian saw an ad for auditions for her state symphony scheduled to take place in 6 weeks. What if? What if I audition, she thought? What’s the worst that could happen? Gillian stopped everything she was doing and searched for violin teachers in her area. After hearing Gillian’s enthusiasm and excitement, a local violin teacher agreed to take her on as a student if she agreed to the following: An hour long lesson twice a week and practice daily for an hour. She sat back for a moment in self-doubt. Can I really do this? Get ready to audition in 6 weeks? What about my job? What about my family? Gillian’s family saw how much she became alive when she talked about this. She scheduled a housekeeper and had the family assist in cooking meals. Her desire to become part of the symphony became a family calling. They all rallied to support her. Gillian became so focused at work that she was more productive in less time. Her boss was impressed and secretly cheering her on. The big day came. It was audition day. Gillian was nervous yet knew she put all her effort in to the best of her ability. They called her name. She sat down, took a deep breath and played the best 2 minutes of a classical piece she’d played in her head for over 20 years. The judges immediately said – You’re in! Gillian devoted one hour a day to her dream. Can you do this? How passionate are you really? What are you willing to do to make your dreams happen? Who do you need to become to make your reality? Are you ready to get back in tune with your passions? And, find out how to make them become reality? Stay tuned, I will announce shortly an outdoor retreat to get you back in touch with your dreams and release what’s holding you back. It’s time to put your dreams in reality. I can wait to share this with you.